You Haven't Left The Building But Your Brain's On A Virtual Reality Trip : Goats and Soda You can now experience the aftermath of Nepal's earthquake or get a sense of what it's like to be in a refugee camp without leaving home. Will that make you more likely to donate to a cause? 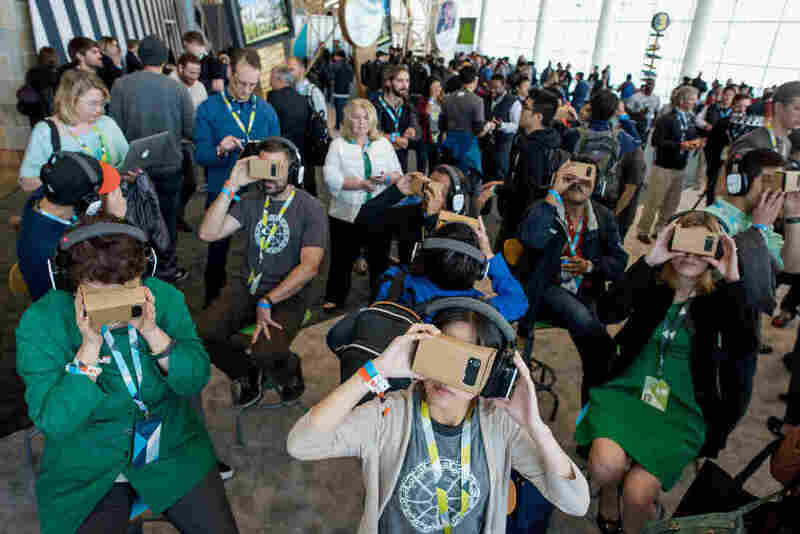 Cardboard Google goggles whisk viewers into a virtual reality world. For just a few minutes, I'm standing in the streets of Kathmandu. Families pick through the rubble left behind by April's devastating earthquake. I take in the sounds of metal clanking, of footsteps and chattering. A few people walk by, staring straight at me. I want to help — but can't. That's because I'm not actually in Nepal. I pull off the virtual reality headset — a pair of headphones and futuristic-looking goggles — and I'm back at NPR headquarters in Washington, D.C.
What I just experienced is the first natural disaster film shot in virtual reality, says David Darg, creator of the 4-minute video. He's a humanitarian worker, filmmaker and cofounder of the Los Angeles-based news site Ryot, which connects every story to a call to action. At the end of the Nepal video, actress Susan Sarandon, whose voice has been guiding me through the journey, tells me to visit the Nepal Quake Project to donate to relief efforts. Shortly after the earthquake, Darg flew to Nepal with a special camera that looks something like six GoPros attached to a sphere and mounted onto a tripod. The GoPros film simultaneously in six directions, capturing a 360-degree view. In the resulting video, viewers choose which direction to look by turning their heads — as if they're standing in the midst of the chaos. Don't have a virtual reality headset? Try watching this on a smartphone and move the device around. Or you can watch it on the computer and use your mouse to drag the screen. "It's an interesting evolution in filmmaking where humans aren't directing the scenes," Darg says. "My job as a filmmaker is to start the camera and get as far away from it as possible." Ryot is part of a new breed of journalists and activists who are experimenting with the technology to tell stories. Project Syria, for example, places people in the computer-generated streets of Aleppo just as a bomb goes off. And earlier this year, the United Nations partnered with interactive filmmaker Chris Milk to produce a video in which a real 12-year-old Syrian girl guides you through a refugee camp. At one point, you look down and are surrounded by giggling children. You can't help but want to reach out to them. "You register it as an experience that you have rather than something that you watch, so you have a higher level of empathy for what you're seeing," says Darg. He and Ryot cofounder Bryn Mooser hope the heightened empathy will encourage viewers to donate to a cause or get involved some other way. And they may be onto something. At the Virtual Human Interaction Lab at Stanford University, founding director Jeremy Bailenson has been studying since 2003 how "walking a mile in someone's shoes" through virtual reality changes the way people think about certain situations. "In general, when we run these studies, we tend to find that experiencing something causes you to have more empathy than imagining it or watching it," he says. In one study, Bailenson and his colleagues found that students who "experienced" being colorblind through a virtual reality headset voluntarily devoted more time to helping a colorblind student than those who simply imagined having the condition. The tests are preliminary, Bailenson warns. Researchers at his lab are still studying how long the effect can last and if it's consistent among people of different ages and cultural backgrounds. But Harper has no doubt that once more virtual reality goes mainstream, corporations, nonprofits and media organizations will all use it to vie for the public's attention. Some might try to sell a product or promote a cause. Others may simply spin a compelling narrative. "Having the ability for audiences to much more closely feel and see work that happens on the ground halfway around the world is extremely powerful," says John Trybus, deputy director of the Center for Social Impact Communication at Georgetown University. And a call for action at the end of the video could be really effective. That's when a viewer's emotions are high. Trybus applauds Ryot for their use of authentic footage in the Nepal video but says he'd like to hear more local voices — and a stronger appeal. But in the end, it all comes down to a very old-fashioned art. Says Harper: "All the fancy technology in the world is not going to replace classic storytelling."